A pilot program offering some Uber drivers workers’ compensation benefits could be mirrored by other gig economy platforms, insurers and industry observers told Bloomberg BNA May 12. The ride-share platform this week teamed with insurers OneBeacon and Aon to launch a driver injury protection insurance program in eight states. 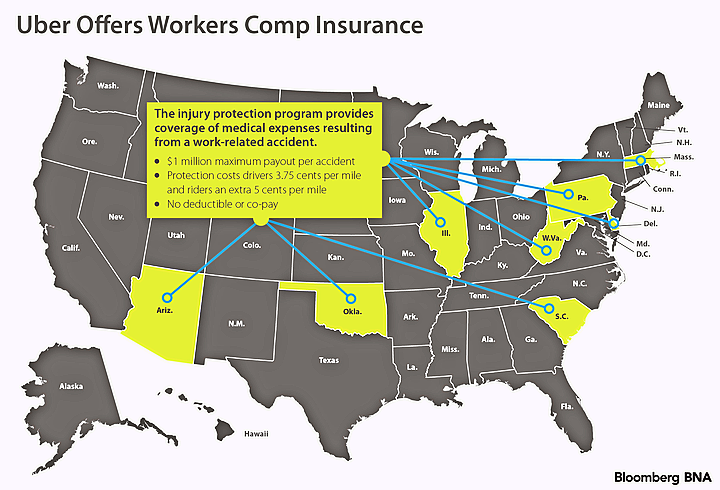 The optional protection, which costs drivers 3.75 cents per mile and riders an extra 5 cents per mile, offers $1 million maximum coverage of medical expenses and weekly earnings due to a work-related accident. For now, coverage is available in Arizona, Delaware, Illinois, Massachusetts, Oklahoma, Pennsylvania, South Carolina and West Virginia. That could expand to more states as Uber sees the results of its pilot program, company spokesman Michael Amodeo told Bloomberg BNA. The program resembles other benefits proposals already being considered for on-demand workers. “Gig” economy workers are often treated as independent contractors who usually aren’t offered benefits and don’t get minimum wage, overtime and workers’ compensation protections. Gig businesses have been reluctant to offer benefits, at least partly because they fear it would make courts and regulatory agencies more likely to find that contractors should be classified as employees. The National Employment Law Project, which advocates for workers, criticized Uber for passing along the cost of the benefit to drivers and consumers. But the concept is expected to drive other on-demand platforms to launch similar plans. Uber’s concept comes as Congress and state lawmakers are considering legislation that could provide workers with portable benefits such as insurance, retirement and other benefits. The concept, which would follow a worker from job to job, could largely resemble the building trades unions in the 1950s when carpenters worked for multiple contractors. Adrian Durbin, spokesman for ride-share platform Lyft, told Bloomberg BNA May 11 that the company welcomes new innovations for drivers to gain insurance protections. “We are looking into a number of possibilities but don’t currently have something precisely like this,” he said, referring to the Uber concept. Such a plan could be hard to mirror, according to Natalie Foster, a fellow at the Aspen Institute’s Future of Work Initiative. “In general, companies tell us that it is hard to provide in the context of the independent contractor relationship,” she said. Handy is one of the gig economy businesses talking with New York state lawmakers about possible legislation that would provide workers with portable benefits. The bill would also update the legal line between independent contractors and employees. The Uber driver insurance program resembles plans already in place for other workers. That includes the Black Car Fund, a nonprofit organization created in 1999 to provide wages and medical benefits for black car and limousine drivers injured on the job in New York. The protection is paid by a fee added to the ride fare. Other gig economy platforms offer some similar protections. That includes delivery platform Postmates. The company offers its independent contracts free protections such as up to $1 million in general liability insurance for its bike couriers. Postmates offers its independent contractors free protections such as up to $1 million in general liability insurance for those on bikes impacting third parties, and auto excess insurance for those using automobiles, according to Vikrum Aiyer director of policy and strategic communications for Postmates. “That’s on par with industry standards within the on-demand space,” he said to Bloomberg BNA.